Squash House Quilts: Welcome and a Contest! Hello and welcome to Squash House Quilts! This is my first attempt at a blog - I’ve been inspired by so many of you ever since I read my first blog - PamKittyMorning - this past winter. I’ve sewn all my life and began quilting in the mid 90’s. I’m primarily self-taught through PBS sewing shows, magazines and books and since I found quilt bloggers, I can’t believe the wealth of information and talent out there that have increased my skills and knowledge! I’m still working full-time, but my husband and I plan to retire this coming spring to a house we purchased in Eastern Washington two years ago. With this blog I hope to chronicle the adventures of our move, my quilting and other aspects of my life with my wonderful husband. Which brings me to the title of my blog - Squash Houses Quilts. We call our newly purchased home The Squash House from the book Winter’s Tale by Mark Helprin. In this incredibly good fantasy, he describes a wonderful place in upstate New York and a house aptly named. Since Fall is my husband and my favorite time of year, and I love “anything pumpkin”, we thought it a fitting name for our first house purchased together as husband and wife. We didn’t search very hard for this house – I like to think it found us! We knew we wanted it the minute we stepped in the front door. The quilt shown at the top of my page is one of my first and probably most favorite quilts. It's a combination of machine and hand applique and has a tiny bit of beading. I can't tell you how many more pumpkin quilt projects I have lined up! To start off, I thought it would be fun to have a contest to name my latest purchase - an Electra 7 cruiser bike. Isn’t she cute? Reminds me of the bike I had as a child, only this one has seven gears and a much softer seat! Don’t you think she deserves a retro name for her retro look? So please leave me a comment with a name you think might suit her. 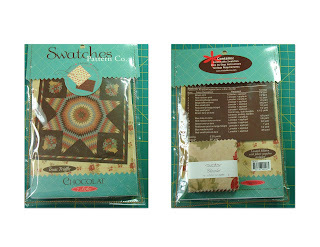 The winning name will receive this Swatches “Texas Truffle pattern which includes a sample of every print from Moda’s 3 Sisters Chocolat line in 2 1/2 “ squares. In order to give you plenty of time to leave comments, I’ll announce the winner on Friday, Sept. 26th. So - a little but more about me….I love gadgets! I’ll buy any quilting/sewing tool that has a terrific purpose. Since we’ve known approximately when we planned to retire for several years now, I’ve been making a point to buy all the tools/machines I think I will need prior to then so I won’t have to spend so much when our income “reduces”. Of course I don’t expect that to last too long and will most likely find myself working part-time in a quilt store to support my fabric and gadget habit at some point. In future posts I’ll be highlighting some of my favorite tools. Don't forget to suggest a name for my bike in the comments section! Hi Candace congrats on your new blog. I wish you lots of success. Its hard to tell exactly what color your bike is but I would call it Tiffany because it is sorta kinda the blue from Tiffany's. I posted more info about the exchange on my blog. Let me know for sure if you want to join us now that you know more info. Thanks. I definitely think that Pedal Pushing Prudence would be a winner of a name. This is a very nice blog, and thanks for the link. Hmmm, the colors remind me of my mother-in-laws kitchen and their house was built in 1955 so I think I would call the bike Flirting with the Fifties and for a nickname you could call it "Flirt". Nice blog! I came over from Freda's Hive. Her block exchange will be fun - that is if I can get all the blocks done! Welcome to the blogging world! I saw your post on Freda's Hive and thought I would check out your blog. I LOVE fall too. Mmmmm pumpkins! I can't wait to see more from you. NO idea on a name for the bike - sorry. I was never one to name cars and bikes and such. it IS cute though. Great first post. How wonderful your home has a name. Nanette came up with a great bike name. I think I shall go with Trudy. glad you decided to blog. I started in January and have enjoyed it tremendously. I'm not really creative when it comes to names for your bike but I'll think on it! I've joined the swap too! The blog looks great Candace and I love your first quilt, that is absolutely charming! I'm so glad you shared a picture of yourself as well, I LOVE having a face to put with a personality! What an awesome photo too! I love Linda's suggestion, I think "Pru" is a perfect name for that bike, LOL Too cute! Your blog is fabuloso! Congrats! Maybe you could help me with my blog? She looks like a Betsy Lou to me. Reminds me of my bike as a child too. Actually wish I had one like this as I don't like the bikes that have you sitting hunched over the handlebars. I would take up bike riding again if I had this one! Congratulations on your new blog! Olive or Ida....you can use these as a play on words. Olive for I love you or Ida for I-da ride you! Congrats on your new blog. I'd go with "Lilly" for a name for your bike. Don't know why, it just popped into my head. Congratulations on the new blog. Congrats on your new blog. You'll be happy that you took the leap. I love your new bike. Let's see I would call her.......yes her cause shes gotta be a her............Blue Beauty. Yes that's what I would call her. Blue Beauty with a basket. Her name should be Bluebelle because she is blue, beautiful and has petals. Nice blog and a nice bike. I like the name Speedy. Congrats on joining the blogging world...looks like we're in the same group for the cottage block exchange! How about Betty Blue for the name of your new bike? Candace, welcome to blogland! I love Moda so I'll play along... Your bike reminds me of one of my favorite fictional people who rode a bike, Miss Marple, so I suggest Jane. Hi Candace, I am so impressed with your blog! Very fun & colorful! It inspires me to dust off the sewing machine & get going again. . . I love your bike. I can just see you running errands on it or peddling slowly on a hot summer day. How about Trixie for her name? She's very stylish! I enjoy reading your blog. For naming your bike, I will go with the candy theme of your name and say Lolly Pop, or Lolly for short. Going to take Lolly for a ride! How about naming the bike Candi's Cruiser? Love your blog. I had to read through the whole blog to see if I could figure out where you lived and moved to. I guess either Mukilteo or Everett and you moved to Dayton or Aston. I lived in Mukilteo and Pasco. I would name the bike PRETENTIOUS.